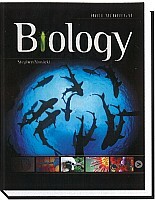 Holt McDougal Biology is focused on making biology relevant for students through intriguing questions, exciting and easy-to-use technology, and extensive examples in the book and online showing biology in action. -Emphasizes real-world connections and data analysis. -Includes engaging technology such as virtual labs, animated biology simulations, interactive review games, visual concepts, and virtual investigations that allow students to connect with key biology concepts.